Rhodes Food Group is waxing it where cheese is concerned. 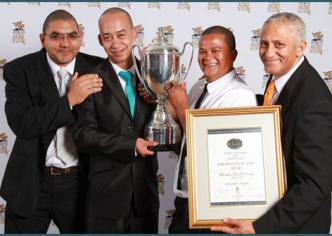 The Big Cheese this year is their Franschhoek Angelot, which not only won a coveted 2012 Qualité Award, but was voted the 2012 Product of the Year at the South African Dairy Championships. Franschhoek Angelot, which is marketed in the Western Cape, Gauteng, KZN and the Eastern Cape (PnP) under the Portobello brand, shared the podium with another Rhodes Food Group product, the Woolworths Ricotta, which also won a Qualité Award. 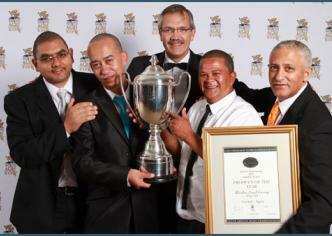 The group is justly proud to also have won five 1st prizes in the SA Championship 2012, two 2nd’s and three 3rd prizes. In another big win, the group’s Assistant Cheese Maker Marlon Visagie was chosen from 28 candidates to attend the coveted cheese makers course in Burgundy in France, in September. A Qualité Award is a symbol of outstanding quality for dairy products and is only awarded to South African Dairy Champions, which have obtained specific points on the international scorecard. The first objective is to reward manufacturers who have achieved outstanding quality in their products and secondly, to make these products recognisable to the client in the trade. Only a very limited number of products obtain the prestigious Qualité Award during the annual South African Dairy Championships. These products are then allowed to display the distinctive logo on the awarded products for the ensuing year. The judging took place in March at the annual South African Dairy Championships, and the awards dinner was staged in Stellenbosch at the end of April.